Our new flagship tyre AZENIS FK453 is distilled from six years of development and thousands of kilometres of racetrack and test driving. 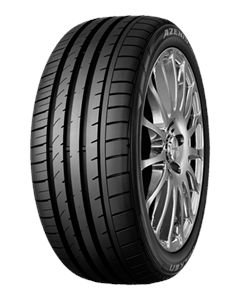 The striking tread design is dominated by longitudinal grooves - three wide and one narrow. Together with the offset sipes integrated into the tyre shoulder, this new tread efficiently deflects high water volumes and offers outstanding aquaplaning resistance. In combination with a rounder shoulder to enlarge the tyre footprint, the NUR-Spec* design features a full dual cap layer area, significantly improving directional stability at high speeds. Higher stiffness in the outside wall helps to improve cornering, while alternating phaseshifted tread blocks cut noise levels. We solved the complex problem of finding a balance between a soft tyre for good wet grip and the demand for durability and top road performance by producing an all-new rubber compound with a high proportion of silica. The addition of silica to the new NUR-Spec* compound has delivered improved handling and superb grip in all road conditions. In short, the AZENIS FK453 is the ambitious culmination of our decades of experience in motor sports. *NUR-Spec = the rubber compound and design were developed with findings gained from the 24h Race experience at the Nuerburgring. Outstanding handling in all driving conditions. Excellent grip on snowy and wet roads. Modern direction-bound profile for permanently reliable performance.